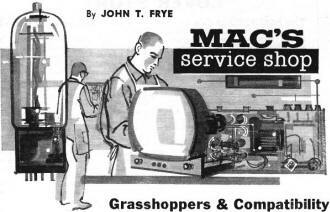 I wondered while reading this adventure of Mac's Service Shop whether author John Frye held stock in the Allen Bradley (now owned by Rockwell) company (you'll understand why). This might be one of the earliest instances of literary product placement in a techno-drama. That A-B resistor is part of the "grasshopper" theme of this saga, which as always is part fiction and part tutorial. Also discussed is the increasing level of difficulty in servicing modern electronics as the transition from all point-to-point wiring to use of printed circuit boards progressed. If Mac and Barney thought PCBs and leaded transistors caused headaches, they would be having brain aneurysms with today's integrated circuits sporting ultra fine pitch ball grid arrays (BGA's), some with more than 500 contacts. "Hey Mac," Barney called to his boss; "look at the broken resistor I found in the bottom of this TV set a farmer brought in this morning. 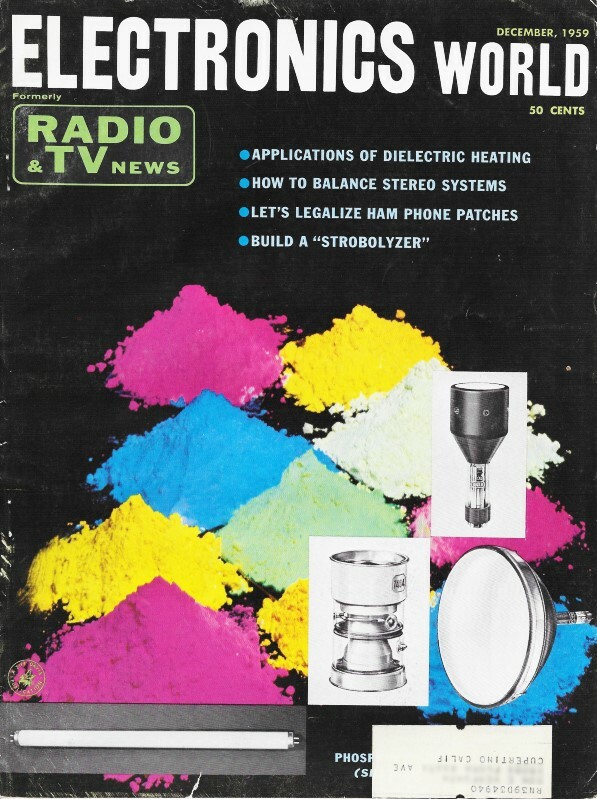 The set's nearly new; so I suppose the resistor fell into the chassis during production and jarred out later." "What's wrong with the set?" Mac asked as he walked over to inspect the two pieces of the one-watt resistor Barney was holding. "Don't know yet, but I think something's wrong with the tuner. There's no picture or sound and yanking the tuner tubes causes no flash of the raster, although pulling the first i.f. tube does cause a flash." Mac swung the flexible bench light so he could see down alongside the tuner. "That's it!" he exclaimed. "The grasshopper's empty." "The grasshopper's empty," Barney mimicked. "Now I ask you: is that any kind of talk for a grown man? We're repairing radio and TV sets, not studying the dietary habits of insects, remember?" "Don't try to be so smart," Mac admonished as he rapped Barney sharply on top of his curly red head with the alignment tool he was holding in his hand. "Do you see anything odd about this tie-point assembly on the side of the tuner case?" "Hm-m-m-m, it looks sort of queer. This long, tapering point on the end is shaped differently from the others," Barney observed as he flipped it with his finger. It vibrated with a pronounced "ping." "That's what technicians call a 'grasshopper,' " Mac explained. "It's a simple but effective circuit breaker used in new RCA black-and-white TV receivers to protect the r.f. circuit inside the tuner if a short occurs in a tube. Let me show you how it works." Mac got out some service literature and studied it carefully for a few seconds. Then he took an 870-ohm, 1-watt Allen-Bradley resistor from the resistor chest and bent a lead at right angles 7/16" from the resistor body. The other lead was also bent at right angles so that the distance between the two bends was 1 7/16". Finally he snipped off the ends of the two leads so only 1/4" was left between each end and the adjacent bend. Next he hooked one end of the resistor through a hole in the top of the odd-shaped tie-point and sprung the point down with his thumb while he hooked the other resistor lead through a tie-point on the opposite end of the strip. Tension produced by the tapered, spring-like tie-point held the resistor firmly in place, making an angle of about thirty degrees with the tie-point strip. The whole thing did look a little like a grasshopper poised to jump. "If an r.f. tube short-circuits." Mac explained, "the heavy current through the resistor heats it until it chars. The spring tension pulls the weakened resistor in two and breaks the circuit, thus saving the tuner coils from damage." "Hey! That's neat!" Barney applauded; "and the same little old grasshopper could be used to advantage in lots of other places as a cheap, self-indicating, reliable fuse. I can think of a couple of places in my ham rig where I can use that idea. Well, flip on the set and let's see if it plays." "Aren't you forgetting something?" Mac asked quizzically. Barney flushed to the roots of his red hair. "I win the ermine-trimmed tube puller!" he said in disgust. "Gimme that r.f. tube and I'll check it." Sure enough, the tube was shorted. When a new one was put in the tuner, the receiver played perfectly. "Well, I may as well slap it back in the cabinet," Barney said. "Wait a minute. I want to show you something else about this set that may come in handy," Mac said as he looked up from the service literature he had been studying. "See this resistor in series with one of the primary leads of the power transformer?" Wuerth Surgistor vacuum tube life extender listed on eBay. "It's a new negative-temperature-coefficient surge resistor. Cold, it measures about 120 ohms; but when current passing through it heats it up, the resistance drops to one or two ohms. RCA calls it a 'Tube Guard' because it furnishes a low starting voltage on the receiver circuits and tube heaters, including the picture-tube heater, and allows them to increase gradually to full power. Protecting the tubes from abrupt starting current surges results in a considerable increase in their life. Thermal switches, such as the 'Surgistor,' accomplish the same thing on a stepped instead of a continuously variable basis. What I want to impress on your foggy mind is that this is one resistor that must be replaced with an exact duplicate." "Gotcha!" Barney acknowledged as he started replacing the TV chassis in the cabinet. "I'm sure glad this set was so easy fixed. Extra parts always worry me." "I just wish this little stinker was as easy to fix," Mac said with a sigh as he turned to a printed-circuit a.c.-d.c. receiver on his end of the bench. "I know there's a break somewhere in the printed circuit in this area that causes it to 'intermit' at just one temperature; but I'll be blamed if I can - hey! Wait a minute! I forgot all about my handy-dandy '5X Flash-Magnifier' that fast-talking salesman sold me Monday. He said all the boys were using it to spot hairline breaks in printed circuits." As he talked, Mac took an instrument from the cupboard. It was a combination of a flashlight and a pair of magnifying lenses. The lens system was mounted at right angles on the end of the battery case and the bulb was inside the lens case so that when the large end of this case was placed against a surface that surface was in proper focus and was bathed in a "surround" type of illumination. When the lens barrel was turned around, it had to be held about an inch away from an object for that object to be in focus; and the illumination feature was not used. Mac employed it in this fashion to examine closely the area of the board he had found to be sensitive to tapping. Suddenly he held the "Flash-Magnifier" steady and peered intently through the lens. Then he switched off the set, turned on the "Flash-Magnifier" and set the large end of the lens case down on the board. "Uh-huh!" he said triumphantly; "it looms up like the Grand Canyon through this gadget." Carefully he scraped the protective coating away from a portion of the circuit, placed a drop of solder on the break, and then gave the repair a shot of plastic spray. "That jeweler's loupe we've been using to spot breaks works a lot better than the unaided eye," Mac announced; "but this thing has it beat. You don't have to keep your nose right down on the chassis to see; it's a lot easier to keep things in focus; and that light shining on a hairline break from all angles really makes it show up." "Well, I'm for anything that makes printed circuits easier to service," Barney exclaimed. "Every day we're getting more and more of them into the shop. In fact, most of our bread-and-butter sets, the a.c.-d.c. jobs, are printed circuits. Time was when I could depend on being able to zip through a stack of these in nothing flat. Fixing one of these sets was usually a matter of changing tubes, stringing a dial cord, or replacing filters, shorted output tube plate bypass capacitors, intermittent or open coupling capacitors, or worn-out volume controls. Now and then we got a bad i.f. transformer or oscillator coil just to make life interesting, but even that was quickly solved by substituting a new part. It's not that simple with some printed circuits," he finished with a sigh. "You can say that again - and probably will," Mac agreed. "Tiny cracks in printed circuits are the very devil to find sometimes. That's why I'm willing to buy anything that promises to speed up the process. We've got to work out techniques for cracking these little monsters as rapidly as we do conventional wired jobs. Griping about them does no good. We're going to have to work on them, and that's that. I keep hoping manufacturers are going to make them easier to service as time goes on. These two sets here on the end of the bench are beautiful examples of the difference in printed circuit boards," he said as he turned the two little receivers over on their backs. "Both sets had an intermittent type of noise I finally decided was a defective i.f. transformer," he explained. "It's darned hard to be sure about this, for you can't easily cut the transformer out of the circuit for testing, and a very similar symptom is produced by a crack in the circuit board. Finally, though, I decided to change transformers. Now in Set #1 this was a real undertaking. The four flat leads from the transformer windings were thrust through narrow slots in the circuit board, bent over, and soldered. In addition, heavy flat strips on each side of the shield can were thrust through slots in the board, twisted, and soldered. Getting that transformer loose without wrecking the board was a tedious, nerve-wracking, time-consuming job; and I did not pull it off without loosening some of the foil from the board. Then I had to wait ten days on a new exact-replacement transformer because it was next to impossible to adapt a standard replacement transformer for use. "Set #2 was a different story altogether. The i.f. transformer fits down over this square hole cut in the board. As you can see, the winding terminals are simply bent over and soldered to leads on the board. All I needed to do to a standard replacement transformer to make it fit was to solder a grounding lead to the side of the can. Replacing this transformer was no harder than it would have been in a wired set, and the board was not damaged at all by the replacement. "This is what you might call 'compatible' receiver design. The engineer designed the printed circuit so that standard wired-circuit replacement items could be used without sacrificing a thing in the way of manufacturing convenience or operating efficiency. The transformer leads can be lifted free from the printed circuit so as to isolate it for checking without actually having to remove the transformer. Now that's what I call engineering!" "Amen!" Barney agreed. "And it's' that kind of engineering that makes things easier on the technician's nerves and the customer's pocketbook and creates good will for the manufacturer. I hope we see lots more of it."